We have reached the end of month 7. It really feels close now and although it is very VERY unlikely, we know it could happen at any time. As you know from previous updates we are using the fruit ticker at the top of this page to measure the size of our little one, but now we are looking at it a little closer. Most people know that if a baby is 7lb for example, all is good and baby is what most would consider a healthy weight. So when we know that our bundle is possibly only 3.8lb, you know that if it did happen now, it wouldn’t be good for anybody, so hopefully baby Ackroyd will stay where he/she is for a while longer! 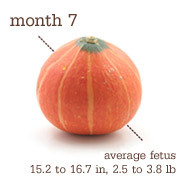 For the 4th and final week we are STILL the size of a squash! Things are still going incredibly well. Other than the vast amount of Gaviscon that has been consumed over the past week, everything is great. Christine is really feeling the extra weight now. She is developing pains in her hips and is generally getting uncomfortable. I am beginning to understand why at the end of a pregnancy a woman can’t wait to have the extra burden moved from her hips to her arms. Today, we did our first load of baby clothes washing. We wanted to give them a clean and an air to get them ready. The picture can be seen here as part of my Silent Sunday, but it was really cool to see all these baby clothes sat drying on the washing line. As some may know, we both work in the travel industry, so when I mentioned to Christine that we were only 56 days to go, we laughed at the relation to booking conditions on a typical package holiday. After 56 days before departure, any change is a major one. We know this won’t be a holiday but I’m sure it will be a little bit of paradise. The comment about Gaviscon made me laugh as my Wife was drinking it by the pint towards the end of the pregnancy. We were always told that bad heart burn indicates that your baby will be born with lots of hair, this wasn’t the reason in our case! I love the Silent Sunday photo definitely one to keep.